what is S32550 Duplex Steel Flanges ? Naman Pipe & Tubes is a S32550 Duplex Steel Flanges stockholders and suppliers, delivering the whole India. we are ISO 9001:2008 accredited and supplies S32550 Duplex Steel Flanges to internationally approved quality standards for applications.S32550 Duplex Steel Flangeshave excellent quality to fully satisfy customer's requirements. TheS32550 Duplex Steel Flangessupplied by us are accepted by clients in various spheres of the industries ranging from basic industries such as Sugar, Paper, Textile, Engineering to more complex such as Oil & Gas, Petrochemical, Chemical & Fertilizers, Power Generation and Nuclear Industries. Naman Pipe & Tubes specializes in S32550 Duplex Steel Flanges With years of experience in manufacturing S32550 Duplex Steel Flanges we offer high quality, lower cost but the best service. As a result to that our export account today is in various cities in india like Agra, Ahmedabad, Allahabad, Bhopal, Bihar, Bikaner, Chandigarh, Chennai, Dehradun, Delhi, Faridabad, Gurgaon, Guwahati, Gwalior, Hyderabad, Indore, Jabalpur, Jaipur, Jamnagar, Jamshedpur, Kanpur, Kerala, Kochi, Kolkata, Lucknow, Ludhiana, Mangalore, Mumbai, Mysore, Nagpur, Nashik, Navi Mumbai, New Delhi, Noida, Patna, Pune, Raipur, Rajkot, Ranchi, Srinagar, Surat, Tamilnadu, Thane, Udaipur, Vadodara. We welcome your inquiries. We offer high grade S32550 Duplex Steel Flanges at affordable price. These S32550 Duplex Steel Flanges are manufactured using finest grade raw material available to ensure international quality. TheseS32550 Duplex Steel Flangesare available in different shape size and thickness according to the needs of our customer. Owing to highly experienced group of qualified professional and use of latest technology machinery, Naman Pipe & Tubes have supplied high quality S32550 Duplex Steel Flanges and profiles to customers throughout the India. As well as being available from stock all S32550 Duplex Steel Flanges can be cut to size and shape according to your fabrication and design requirements and all work is governed by our independently accredited and regularly audited quality systems. OurS32550 Duplex Steel Flangesare sourced from the highest quality steel manufacturers in the world and, like all our suppliers, these manufacturers have been vetted and assessed by our procurement team. FERRALIUM 255 is finding many cost effective applications in the chemical, marine, metallurgical, municipal sanitation, plastics, oil and gas, petrochemical, pollution control, wet phosphoric acid, paper making and metalworking industries. Called "super" because it is more alloyed than ordinary stainless steels and has superior corrosion resistance, FERRALIUM 255 is being used in areas where conventional stainless' are inadequate or, at best marginal. One good example s in the paper industry which was hit with an epidemic of corrosion problems when environmental laws forced recycling of process liquids In closed systems, chemicals such as chlorides can build up to highly corrosive concentrations over time. Paper makers have found that ordinary stainless equipment, which had previously given good service, was no longer adequate for many applications. Principal Features of Alloy 255 Compared To 300 Series Austenitic Stainless Steels. All product forms of FERRALIUM 255-SD50 can be easily welded, and this includes welding FERRALIUM to other stainless steels. Welding can be carried out by all the usual methods although oxy-acetylene welding and electron beam welding have been found to be not suitable. As a result of FERRALIUM 255-SD50’s welding versatility, the designer is provided with full scope to incorporate both castings and wrought forms into a single assembly. It should be emphasised that only genuine FERRALIUM 255 electrodes and filler wire should be used, so as to ensure sound welds and a satisfactory weldment in respect of mechanical strength, ductility and corrosion resistance. FERRALIUM 255 -SD50 alloy is normally supplied in the solution treated and stress relieved condition, which is ideal for welding. Welds in light sections and minor repair welds do not generally require post-weld heat treatment but heavy section welds should be given a solution heat treatment after welding to ensure maximum corrosion resistance and ductility. A detailed welding information document is available upon request - please discuss any specific welding details required with our Technical Department. FERRALIUM 255-SD50 alloy can be welded to carbon steel, austenitic stainless steels and other metal based alloys using suitable welding consumables. The solution heat treatment process for FERRALIUM 255-SD50 is carried out at 1070°C (+/-10°C) and this must be followed by a rapid quench, preferably in water. Lack of temperature variation during heat treatment is essential and adequate time must be allowed so as to ensure that the section is fully soaked throughout at temperature. Quenching must be carried out immediately on removal from the furnace, with the minimum of cooling in air during transfer to the quench tank. A stress relief heat treatment, when required, should be carried out by heating to 350°C and holding for 2 hours at temperature followed by air cool. Heating should be carried out in an air circulating furnace to ensure uniformity of temperature. Depending upon the nature of the component, the extent of machining and the tolerances required, this treatment may be carried out at one or more stages of the machining cycle. FERRALIUM 255-SD50 alloy can be readily machined and it has been found that its machinability is superior to other superduplex stainless steels, for instance, ZERON 100 (UNS S32760). Although FERRALIUM 255-SD50 is considerably harder than the austenitic stainless steels, the same techniques can generally be used, and carbide tipped tools are recommended. A detailed machining information document is available upon request. In common with many stainless steels and high strength materials, heavy machining on FERRALIUM 255-SD50 can set up superficial internal stress and can sometimes result in slight movement during subsequent operations. This may be accentuated by surface work hardening if blunt tools are used. Whilst this movement is not significant in most cases, components requiring specially close tolerances which have been subject to heaving machining should be given a stress relief heat treatment at 350°C. 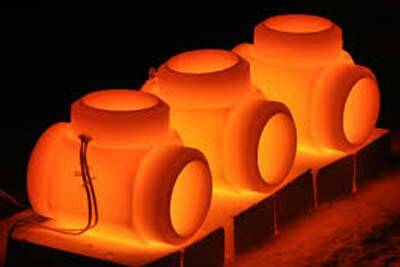 Hot forming can be carried out between 1150°C and 1000°C. At temperatures below 1000°C (primarily in the range 800°C to 950°C) embrittlement takes place due to intermetallic phase precipitation, thus a solution heat treatment at 1070°C followed by rapid water quenching must be carried out after hot forming. For cold forming, when the deformation required is above 10%, a solution heat treatment at 1070°C followed by water quenching should be carried out after the forming process. For deformations higher than 20%, intermediate solution heat treatment stages at 1070°C (with water quenching) need to be carried out after the accomplishment of 20% deformation, 40% deformation and 60% deformation, as appropriate. After any hot forging operation, such as the production of hot-headed fasteners, it must be emphasised that a solution heat treatment at 1070°C followed by a rapid water quench must be carried out after the hot forming process. Insufficiently rapid quenching from the hot heading temperature will cause the formation of deleterious phases which will markedly reduce the corrosion resistance. S32550 Duplex Steel Flangespacking will be according to international standard in bundles strapped by strips then into containers to avoid any damage. We Supply Our S32550 Duplex Steel Flanges to various cities in india like Agra, Ahmedabad, Allahabad, Bhopal, Bihar, Bikaner, Chandigarh, Chennai, Dehradun, Delhi, Faridabad, Gurgaon, Guwahati, Gwalior, Hyderabad, Indore, Jabalpur, Jaipur, Jamnagar, Jamshedpur, Kanpur, Kerala, Kochi, Kolkata, Lucknow, Ludhiana, Mangalore, Mumbai, Mysore, Nagpur, Nashik, Navi Mumbai, New Delhi, Noida, Patna, Pune, Raipur, Rajkot, Ranchi, Srinagar, Surat, Tamilnadu, Thane, Udaipur, Vadodara. Naman Pipe & Tubes is largest suppliers ofS32550 Duplex SteelFlanges.we are supplyingS32550 Duplex Steel Flanges in Agra, Ahmedabad, Allahabad, Bhopal, Bihar, Bikaner, Chandigarh, Chennai, Dehradun, Delhi, Faridabad, Gurgaon, Guwahati, Gwalior, Hyderabad, Indore, Jabalpur, Jaipur, Jamnagar, Jamshedpur, Kanpur, Kerala, Kochi, Kolkata, Lucknow, Ludhiana, Mangalore, Mumbai, Mysore, Nagpur, Nashik, Navi Mumbai, New Delhi, Noida, Patna, Pune, Raipur, Rajkot, Ranchi, Srinagar, Surat, Tamilnadu, Thane, Udaipur, Vadodara. We assured our client that we are standing behind our product which we have supplied as well as we issued a quality certificate along with our product which we manufacture, supplies and exports. We have our Sales representative in these cities can provide you all the information as per your requirement.